Some background to Alan's engineering experience and why he became so deeply involved with the JENAL design/build programme. The UVA (Unique Vehicle & Accessory) Company developed, for the period, Europe's largest range of specialist cars and car components, supplying world-wide specialist car makers, wholesalers and enthusiasts alike. It had a bumpy history as so many of these types of business do. The UVA M6GTR the flagship vehicle of the company. Built on its own composite tub and powered by a range of mid mounted V8 engines. Although based on a 1970's era GT racecar, the M6GTR was a fully functional and compliant road car with many 'creature comforts' and road friendly suspension. The F33 Can-Am was based on the company's F30 Clubman car using chassis technology developed from the Fugitive range of off-road racing cars. Ironically, the side mounted cooling radiators were designed at a similar time to the Ferrari Testarossa but with no collaboration or copying. Just following GP designs of the time. Designed as a fast road & track car with immense strength & safety, afforded by the F33's tubular chassis being part of the roll cage structure. Like the M6GTR, the F33 & F30 were powered by mid engined V8's. Exceedingly quick due to its excellent power-to-weight- ratio. The Fugitive range of single, two and four seater on-&-off-road racing and fun machines were very popular. Partly due to their low price, safety and partly due to the developing off-road racing programmes in Europe at the time. UVA offered an extensive range of equipment to assist the builder/racer construct a wild racer or a simple fun road car. UVA became the largest designer and manufacturer of adaptor kits. 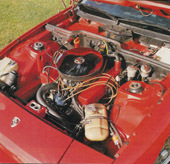 Special components which enabled a range of different engines to be connected to alternative transmissions for example, this picture illustrates a race tuned V8 Rover engine connected to a Porsche transaxle. The extensive range encompassed Alfa Romeo to VW and Chevrolet to Renault. UVA reacted to their specialist car construction needs and designed many additional components including these special lightweight brake pedal assemblies. Designed to be able to adjust the front to rear brake balance from the drivers seat. They were also sold to the open market. V8 Porsche? With the help of a UVA designed adaptation kit it was a reality. The extent of the conversion kit was thorough ~ engine/transmission adaptor, engine mounts, clutch actuation kit, tubular exhaust manifolds and system, suspension, brakes, etc. were all available and specially developed by UVA.